What could be better than waking up to the smell of freshly baked bread. Fully automatic with 10 electronic baking options and a 13 hour programmable function, you can combine your ingredients the night before and serve your family fresh bread every morning. Choose the colour of your crust with light, medium or dark options. Bake a 900g loaf of delicious bread from the various recipes included. It has a non-stick, dishwasher-safe baking pan with dual kneading blades. Fully automatic with 12 electronic programmes. 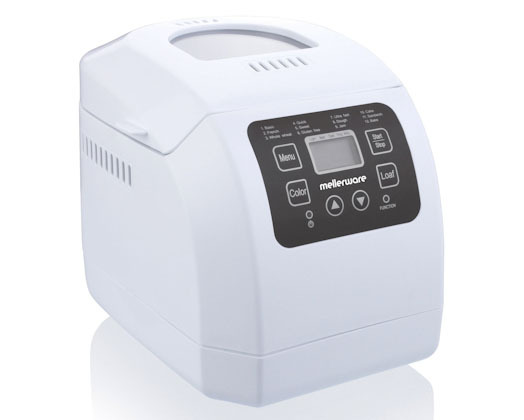 13 hour programmable function allows you to wake-up to freshly baked bread. Detailed instruction manual with various recipes included. Adjustable crust control: light, medium and dark. Can bake up to 900g loaf of bread. Non stick baking pan and kneading blades.